ALLEVYN Plus Adhesive hydrocellular foam dressings have a unique trilaminate structure made up from a wound contact layer, a soft and highly absorbent central hydrocellular layer, and an outer film layer, which is both bacteria-proof and waterproof. ALLEVYN Plus Adhesive dressings employ all the proven benefits of moist wound healing, without any breakdown of the dressing caused by contact with exudates. The result is effective exudate management of these wounds, which have traditionally proved difficult to care for. 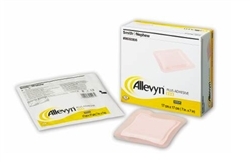 Allevyn Plus Adhesive Foam Dressings feature low allergy adhesive, tapered construction with micro-thin edges, unique trilaminate structure, perforated wound contact layer, and a highly absorbent central hydrocellular layer and waterproof outer film layer. Allevyn Plus absorbs 65% more exudate than ALLEVYN Adhesive. -The perforated wound contact layer allows even viscous exudate to pass into the dressing. -The hydrocellular core of the dressing absorbs and holds liquid in its microscopic structure. -The breathable outer surface of the dressing allows excess moisture to evaporate away from the dressing. The outer polyurethane layer of ALLEVYN Plus Adhesive prevents strikethrough of excess exudates from the dressing, and minimizes the chances of cross-contamination and wound infection, therefore enhancing patient comfort. It also allows the amount of fluid in the dressing to be monitored, as progression of exudates can be seen through the pink top film. 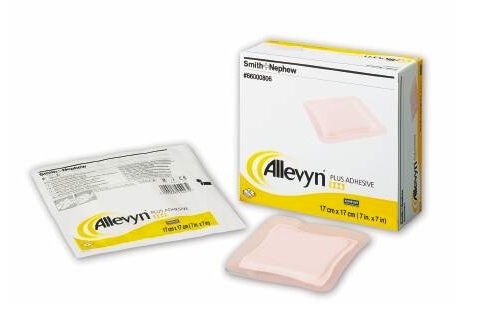 ALLEVYN Plus Adhesive dressings are soft and cushioning, giving excellent patient comfort and protection, contributing to a pressure reduction protocol. ALLEVYN Plus Adhesive is indicated for high to extra high levels of exudate absorption and the management of chronic, acute, full, or partial thickness, or shallow granulating, exuding wounds. Some typical wounds are ulcers (venous, arterial, diabetic), pressure sores, donor sites, surgical incisions, surgical excisions and burns (1st and 2nd degree). Can be used in conjunction with INTRASITE◊ Gel for necrotic or sloughy wounds. Creation and maintenance of a moist wound environment. Moist wound environments have been established as optimal environments for the management of the wound. Select an appropriate size dressing. Prepare and clean the skin around the wound area by removing excess moisture. SKIN-PREP Protective Wipes may be used to protect fragile skin. Peel back the protector papers and anchor the dressing over the wound. Smooth the dressing into place, ensuring that the edges of the dressing are not wrinkled. During the early stages of treatment, ALLEVYN Plus Adhesive dressings should be inspected frequently; dressings can be left in place until exudate can be seen through the outer waterproof film layer and approaches 3/4" from the edge of the dressing. As with all adhesive products, some cases of irritation and/or maceration of the skin surrounding the wound have been reported. It should be noted that too frequent dressing changes, particularly on patients with fragile skin, may result in skin stripping. If reddening or sensitization occurs, discontinue use and consult a healthcare professional.